I’ve always been criticized for going over the top with Christmas, but to me it was always a special time. Christmas for me as a child at Rodboro Manse in British Guiana was enjoyed by the whole community and we all looked forward to special food we didn’t get at other times of year. The cook-up rice and the garlic pork was something we looked forward to all year. All the village women used to come to the manse and help Parson Munroe’s wife, Amy (known to me as “mum”) to prepare the food and decorations for Christmas. The pigeon peas and black-eye peas Parson had grown and I had helped him to harvest were now in crisp dry pods. Shelling dried peas took ages to do so it was a time when many hands made light work and we all sat around sharing stories or village gossip as we did it. The pigs had been fattened in time for Christmas and parson’s farm hand “Li’lboy” with the help of some of the village men would slaughter the pigs and butcher them at the back of the farm and bring the meat up to the kitchen. There mum and some of the village women would cut up the pork into pieces and steep it in white vinegar solution to clean it. Then they would strain it and pack it into large earthenware jars after mixing it with minced garlic, salt, minced hot pepper, finely chopped thyme and a few cloves. The jars of seasoned pork were filled with white vinegar to cover the meat and then they were sealed up and left to set for a few days in a cool place. We all looked forward to the smell of the meat cooking as it was lifted out of the pickling liquid and fried till all the vinegar had evaporated and the meat had browned. We ate mainly fish the rest of the year so this meat was a real treat. Then there was the smoked ham on the bone hanging up in the larder, from which slices were cut when Parson wanted and I always got a share of it. My favourite fruit of the season were oranges, shaddock and other citrus fruits and above all, the pomegranates which Parson grew around the pond. The Manse had a home-made wooden Christmas tree which they brought out as advent started and we made decorations for it out of painted Awara seeds, coloured crepe paper rosettes and other local dried seeds. When dark fell, we lit tiny candles in little metal holders clipped to the branches and I had to sit and keep watch to make sure none caught fire as Parson was very safety conscious and the Manse was built entirely of wood. Fruit harvested from the carambola (Star-fruit) and local “gooseberry” trees had been set with sugar syrup to dry weeks before and when they were ready the process of using them to make “Black Cake” soaked in local rum began. Ginger was ready to harvest as well and no Christmas would be complete without home-made ginger beer fermented with yeast and sugar and bottled during advent. Then there were “mum’s” home-made biscuits with coconut or dried fruit or ground peanuts in them, and sugar-cake. All the ingredients apart from bread flour were grown by Parson on the farm at the Manse or nearby sugar plantation at Bath Settlement. Even the salt we collected in lumps along the beach when the tide was out. I had to help Parson keep the meticulous account books for all the produce he grew and sold as he was accountable to the Congregational Church and the London Missionary Society who sent him seeds from time to time. Besides the food there was the carol singing and the Nativity Play we all looked forward to in the church. Parson had a very busy time over Christmas travelling up and down the coast between Mahaicony and Rosignol in his horse and buggy with me at his side to help him. He visited all the churches along the coast and delivered religious services in them. 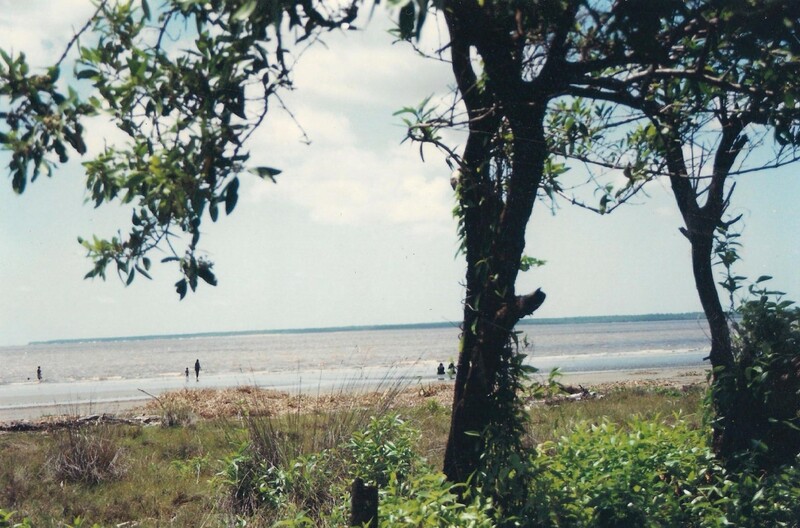 Sometimes we even went to Demerara and up the river to visit Amerindian communities where his missionary friend, the Reverend Pat Matthews was stationed. There was a lantern on the buggy to light the road ahead as we often came back after darkness fell. I had to help trim the lantern wick and make sure the glass was clean before filling the lamp with kerosene. I had to polish the leather harness and help Parson and Li’lboy to groom the horse before such visits. When I first came to England with the Munroe’s after Parson died, we still kept up the traditions of Christmas but it was just me helping mum to prepare the food while all the others were out at work. I did the shopping and saved any money I could from my paper round to buy mum her favourite diabetic chocolates or Roses Lime juice for her Christmas present. We were made to feel very welcome by the local church and neighbours in Oakburn road, and the Sunday-School friends I made always invited me to their homes for parties or tea with their families. After the household broke up and I went off to join the army, I didn’t go “home” at Christmas because I had no real home to go to. Instead I would donate my travel pass to friends who lacked one while I remained in barracks. However, I always remember the kindness of my fellow boy soldiers for inviting me to spend Christmas with their families back in Wales or in the North of England. I learned about English Christmas traditions that way. By the time I was a man soldier in Germany, Christmas took on a new meaning as my German friends and my wife’s German family made a big thing of the family Christmas and I took on board all these traditions enthusiastically as my children grew up. I suppose I spoiled them with presents because I had none myself as a child. You always want to give your children what you never had yourself. I have never tired of Christmas celebrations and all the preparations because it makes me happy and I like to see others happy too. When I joined the Band we had a relentless round of Christmas engagements to play at which took us far away from our homes and families at this busiest time of year when everyone wants quality live entertainment. Charity work for the Blind School at Paderborn and other good causes was also an important part of Christmas for me. The Band put on cabaret shows at Christmas and I wanted to make sure that they were shows for family entertainment that all the wives and children could come to as well as the men. We started preparing the cabarets for the next year almost as soon as the last one was over. My own children as they grew up also wanted to take part in the cabarets and so we found a way of including them and the children of other band members in the shows too. It didn’t stop at Christmas either because New Year celebrations were part of our working lives. The picture above shows me singing in one of our cabarets. No matter how old I get I will always find Christmas a magical time. If you want to read the full story of “An Unlikely Hussar”, most of it can be found on this website but will be available in the New Year in Kindle Format with more photos than those on this website. If you want a hard copy of the book it will also be available to pre-order by Easter if I get enough pre-orders to cover costs. If you want to find out what happened in my later life when I returned to help develop my birth country Guyana in South America, then order “The ElDorado Affair” by Jane Joseph ISBN 978-0-9932409-0-4 published by Sapodilla Press available in paperback or Kindle format from Amazon.co.uk, order it through Waterstones or your local book store via Nielsens teledata or read it in Kindle format ISBN 978-0-9932409-1-1 available worldwide on Amazon.com Follow me here or on my Jane Joseph Author page on Facebook.